Mehodihi: Well-Known Traditions of Tahltan People - "Our Great Ancestors Lived That Way"
File mainly contains images of Northwest Coast metal artifacts including bracelets, daggers, coppers, spoons. The textual records include photocopies of images found in the file. 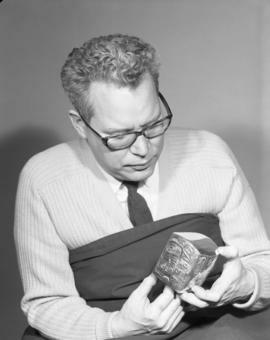 Image of Bill Reid, seated, holding a small metal box with intricate carving on the exterior.